Price After $100 Instant Rebate. 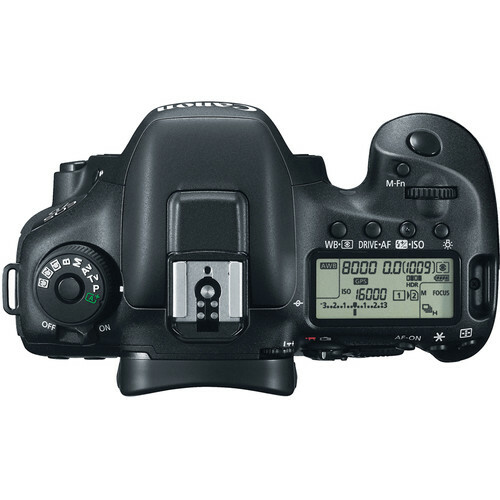 Original Price $2149.00 Â FREE SanDisk 64GB SDXC Extreme PRO Memory Card (95mb/s), Mini HDMI Cable and Spare Battery.Â Designed with a penchant for speed, the EOS 7D Mark II DSLR Camera from Canon is characterized by its APS-C-sized 20.2MP CMOS sensor, dual DIGIC 6 image processors, and a top continuous shooting rate of 10 fps. Both a 65-point all cross-type phase-detection AF system and Dual Pixel CMOS AF technology benefit fast, accurate focusing performance for both optical viewfinder and live view shooting. Additionally, the combination of the dual image processors along with the CMOS sensor also contribute to enhanced low-light sensitivity to a native ISO 16000, which is further expandable to ISO 51200. 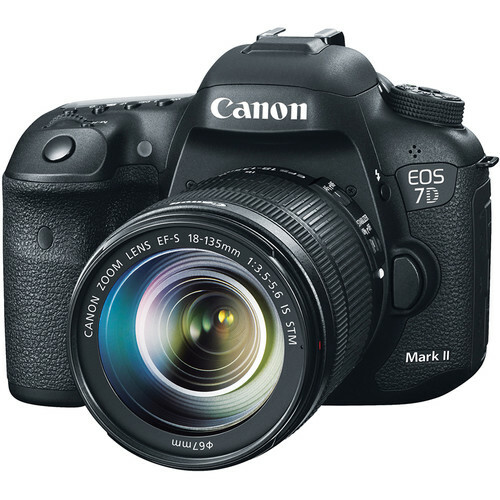 The 7D Mark II comfortably performs in a range of challenging situations, and while ideally situated as a tool for sports and wildlife photographers, it resides equally as well in the hands of contemporary multimedia image-makers. Complementing the 7D Mark II's still imaging assets, support for recording full HD 1080p video is available, in multiple frame rates up to 60 fps. Beyond saving to internal memory cards, uncompressed video can also be recorded to optional external recorders via an HDMI connection. Custom Movie Servo AF, which is aided by the Dual Pixel CMOS AF system, serves to highlight movie recording abilities by enabling controllable speed and sensitivity settings for continuous focusing with moving subjects. Housing the robust set of imaging capabilities is an equally robust dust and weather-sealed magnesium alloy body, which contains a durable shutter mechanism tested for up to 200,000 actuations. A fixed 3.0" 1.04m-dot Clear View II LCD screen is incorporated into the design, along with a bright Intelligent Viewfinder II optical finder, for versatile monitoring and playback abilities. Customizable buttons are placed about the body for personalized control over different settings and a built-in GPS module automatically embeds location data into files for geotagging images when shooting. The EF-S 18-135mm f/3.5-5.6 IS STM lens is included along with the camera body to serve as a versatile everyday lens that encompasses a 35mm-equivalent focal length range of 28.8-216mm. The STM stepping motor helps to achieve near-silent focusing when used in conjunction with the Movie Servo AF mode and the optical image stabilization system helps to minimize the appearance of camera shake. 20.2MP APS-C CMOS Sensor and Dual DIGIC 6 Image ProcessorsFeaturing a 20.2 megapixel APS-C CMOS sensor and Dual DIGIC 6 image processors, the 7D Mark II is capable of producing high-resolution, well-detailed still imagery and full HD 1080p video with notable sensitivity and minimal noise. A native ISO range of 100-16000, which can further be expanded to ISO 51200, is well-suited to working in difficult lighting conditions and the processing power of the DIGIC 6 processors also contributes to enhanced low-light quality with smooth color and tonal gradations and corrected optical aberrations. 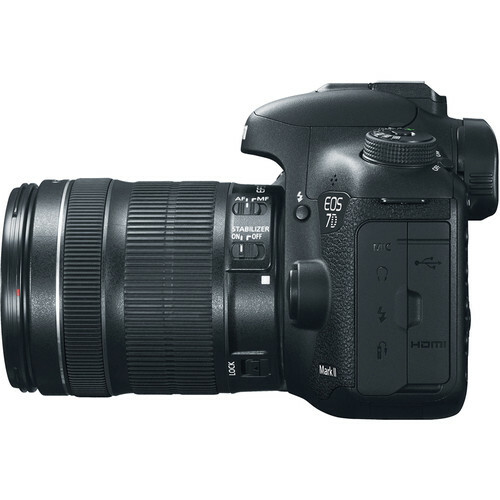 The dual processor design further benefits the imaging system through the addition of speed, which avails 10 fps continuous shooting for over 1000 JPEGs, 31 RAW, or 19 RAW+JPEG files, along with a top shutter speed of 1/8000 sec. and a top flash sync speed of 1/250 sec. Additionally, a shutter lag time of 0.055 sec. and a start-up time of just 0.1 sec. help keep the camera ready to perform when desired.65-Point All Cross-Type AF SystemWhen shooting with the optical viewfinder, a 65-point all cross-type autofocus system is used to provide wide frame coverage for acquiring focus accurately and quickly. The center point of this cluster is a high-precision dual cross-type sensor that benefits working with f/2.8, or faster, lenses and supports focusing down to -3 EV to enable working in low-light conditions. These focus points are configurable and allow homing in on specific elements within the frame to focus on, or, alternatively, all can be used to provide coverage across the frame.Dual Pixel CMOS AFDual Pixel CMOS AF is a refined live view focusing technology that works to provide incredibly quick and precise autofocusing abilities that function in a similar manner to how a camcorder acquires focus. This system integrates two separate photodiodes within each pixel to provide a broad and dense network of phase-detection gathering elements across nearly 80% of the frame to help reduce focus hunting for faster, more direct control of focus placement. Dual Pixel CMOS AF is utilized during live view applications, for either still or video shooting. When working with still imagery, this focusing system works to acquire focus quickly and accurately, making it ideally suited to shooting and tracking moving subjects so that critical focus is attained with each shot. When shooting video, focusing is smooth and natural when changing from different subjects or different distances within the scene. Subject tracking in movies is also heightened due to the Dual Pixel CMOS AF system's ability to recognize subjects and maintain focus when working within changing or cluttered scenery.EOS HD VideoFull HD 1080p video recording is supported in multiple frame rates, up to 60 fps, in both the MOV and MP4 file formats. Additionally, uncompressed video can be recorded to an optional external recorded via the HDMI output. In-camera video is recorded using the high quality H.264/MPEG-4 AVC codec and manual exposure control is supported for greater refinement over the look and feel of recordings. Video clips are automatically partitioned after the file size has reached 4GB and both IPB and All i-frame compressions are available for use depending on editing and output preferences. When recording video, customizable Movie Servo AF can be utilized to adjust the focusing location, speed, and tracking intervals for fluid and smooth AF quality. Support is also available for STM lenses, which deliver exceptionally quiet and smooth focusing to benefit the overall quality of movies. In-camera audio is recorded using the Linear PCM format for MOV files, or the AAC format for MP4 files, and support is available for utilizing an optional external microphone during recording. Additionally, a headphone input is also available for real-time audio monitoring.Body DesignFeaturing a durable magnesium alloy body with a shutter tested to 200,000 cycles, along with enhanced mirror and shutter drive mechanisms, this rugged camera is also sealed to resist dust and moisture for use in inclement conditions. On the rear of the camera is a bright, large 3.0" 1.04m-dot LCD screen that can be used for live view monitoring, image review, and menu navigation. It features a smudge-resistant and anti-reflective Clear View II coating to better enable viewing in bright lighting conditions. Alternatively, for eye-level finding, an optical Intelligent Viewfinder II is incorporated into the design and provides 100% frame coverage, for greater composition accuracy, and an overlay display to highlight pertinent shooting settings, such as a digital level, exposure information, and other camera functions. 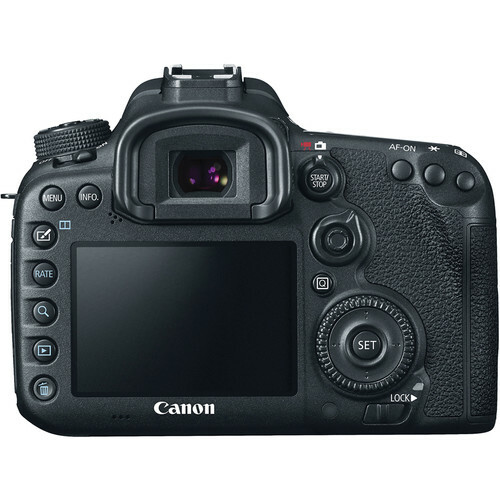 The body design also incorporates a dual memory card slot that accepts one CompactFlash card and one SD/SDHC/SDXC card to extend file saving capabilities by permitting overflow recording or in-camera duplicating. The camera also features a range of customizable controls that can be configured to adjust a range of settings based on your personal preference.Scene Detection System and Exposure MeteringFor enhanced precision in regard to exposure metering, an iSA (Intelligent Scene Analysis) system employs an independent 150,000-pixel RGB metering sensor, which benefits the iTR AF (Intelligent Tracking and Recognition) system, for consistent, precise subject tracking and exposure metering capabilities. These systems also incorporated dedicated tracking algorithms designed to recognize faces and colors, too, to support both exposure metering and autofocus functions.Canon EF-S 18-135mm f/3.5-5.6 IS STM LensIncluded with the 7D Mark II is the EF-S 18-135mm f/3.5-5.6 IS STM lens, which provides a 35mm-equivalent focal length of 28.8-216mm. Covering a range of perspectives from wide-angle to telephoto-length, this lens is a highly versatile tool for use in everyday situations for both still image and movie recording. Its design integrates an STM stepping motor that provides near-silent focusing abilities with smooth and precise control. Additionally, the optical image stabilization system helps to minimize the appearance of camera shake by up to four shutter speed steps in order to benefit working in low-light conditions and with greater zoom magnifications. One PMO (precision molded optics) aspherical lens element and one UD (ultra-low dispersion) element are also incorporated into the lens construction to help reduce chromatic aberrations throughout the zoom range and an optimized lens coating has been applied, too, in order to lessen lens flare and ghosting for higher contrast, clearer imagery.Other Camera Features A built-in intervalometer permits the creation of time lapse imagery and supports recording 1-99 consecutive frames in pre-selected intervals. The bulb shutter speed setting enables you to keep the shutter open as long as desired for an expanded range of creative exposure capabilities. An integrated GPS Receiver automatically records location data with each exposure, including longitude and latitude, elevation, and UTC time as EXIF data, and also provides a digital compass. Movement can also be tracked at set intervals to showcase your routes taken during shooting. Advanced mirror vibration control technology supports the 7D Mark II's exceptional continuous shooting speeds and helps to maintain consistent results during shooting bursts. A flicker detection system can automatically warn you, in the viewfinder, when a flickering light source has been detected. The effects of these light sources can be compensated for using the Anti-Flicker Shooting function, which will automatically record images only during instances of peak light volume. This system is especially useful for reducing inconsistent exposure or color results, which are prevalent when continuously shooting in difficult lighting conditions. In-camera correction for a variety of lens aberrations is possible, including the ability to control peripheral illumination, chromatic aberration, and other distortions. When working in live view, the Image Simulation Function can be utilized to monitor the effects of distortion correction for fine-tuning your results. A USB 3.0 terminal is available for expedited transfer speeds between the camera and a computer or the optional WFT-E7 (Version 2) for Wi-Fi connectivity. Picture Style modes allow you to set predefined looks to imagery in-camera and include Auto, Standard, Portrait, Landscape, Neutral, Faithful, Monochrome, and up to three User Defined settings. Language support: English, German, French, Dutch, Danish, Portuguese, Finnish, Italian, Norwegian, Swedish, Spanish, Greek, Russian, Polish, Czech, Hungarian, Romanian, Ukraine, Turkish, Arabic, Thai, Simplified Chinese, Traditional Chinese, Korean, and Japanese.